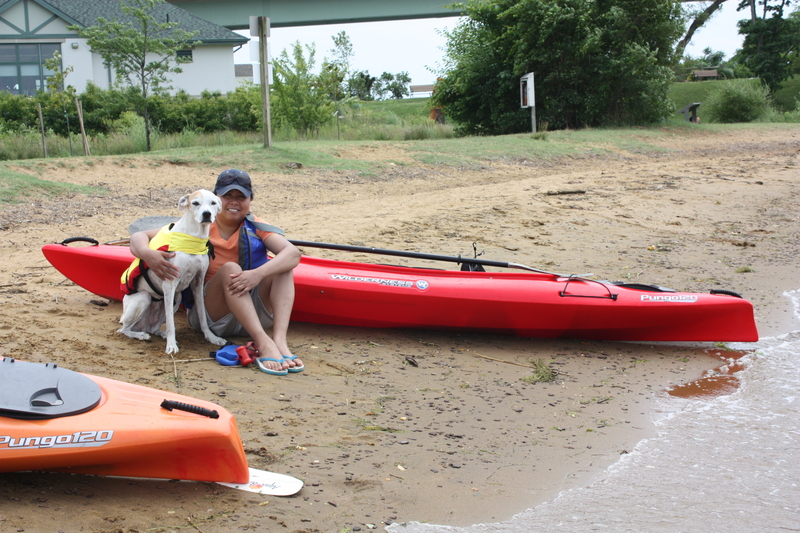 Do You Paddle With Your Dog? We try to include our canine companion, Alex, in as many activities as possible in order for her to enjoy herself, spend time with us, and be a balanced dog. While in Maryland, we went kayaking in Annapolis and we really enjoyed ourselves. 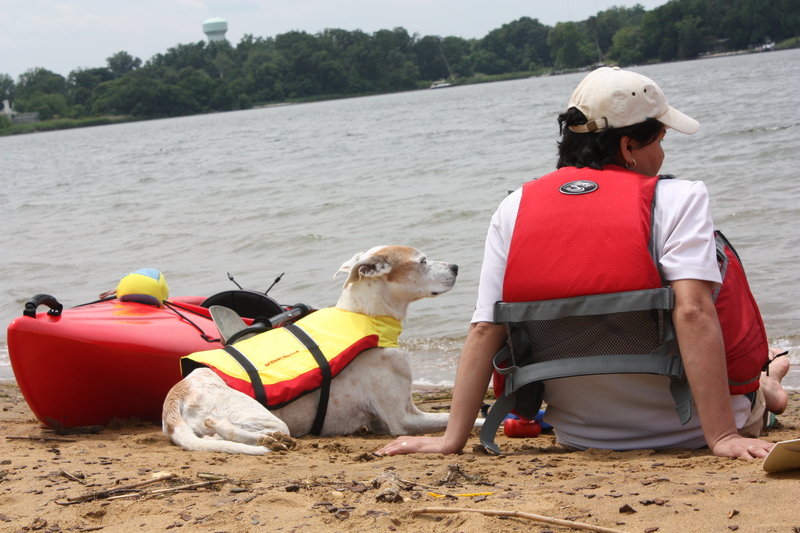 Before I forget, make sure your dog is wearing a life jacket. The above picture was taken after we finished kayaking and Alex was falling asleep. She looked so tired that you would have thought that Alex was the one doing all the paddling. No ladies and gentlemen, I was the one paddling with a cute cargo, Alex, of 45lbs. She did better than any other time. I was glad because that day the water was choppy and a little windy so we got wet when a couple of waves hit us head on. Not to worry, the waves were very small. Kayaking with Alex is always fun, and if we are ever back in Maryland we’ll make sure to kayak early in the morning or late afternoon in order to avoid excessive heat. Have a great weekend! 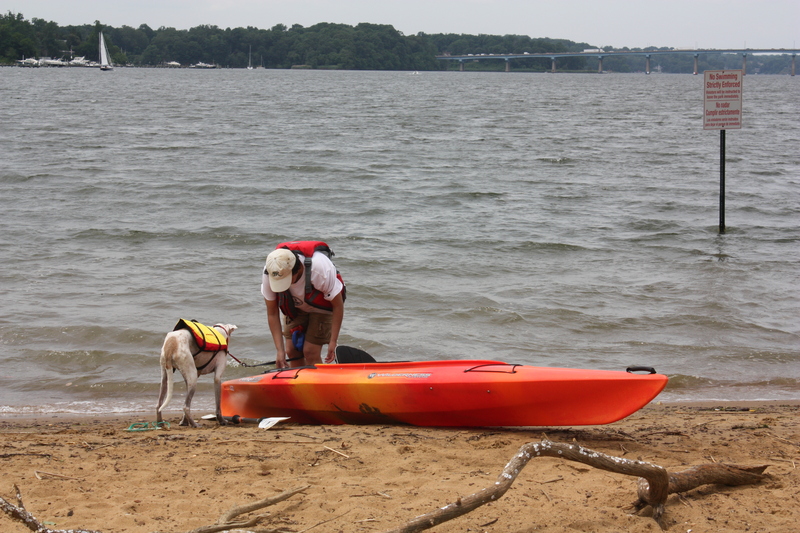 This entry was posted in Dogs and tagged heat, kayaking, life jacket, Massachusetts, paddles, summer, Training. Bookmark the permalink. Aww I love your posts about your doggies ! I’m travelling too much to own a dog at the moment but eventually I would love a k9 companion! Thanks for stopping by. Enjoy your travels. I traveled a lot before getting my first dog and I don’t regret it. Lol. Why? Tell me, I am curious. Alex moves a little bit once she is in the kayak, but I realized that the more we do it, the better she gets at it. Nope! I’ll swim any day, but kayaking with Mom driving the paddle – I don;t think so. We’ll end up in China, her sense of direction is so underdeveloped. Lol. Omg, you are too funny. I have a horrible sense of direction, but you know what? So far I’ve never had any incident that would deter me from kayaking with Alex. I only wish Sam enjoyed the water. He will sidestep a puddle on the sidewalk. It would be so fun to be able to do what you guys did. Have a great weekend!